Controls Service, Inc. was established in 1972, in Dearborn Heights, Michigan, as a field service organization providing maintenance, calibration, repair, and testing services for process control systems. Controls Service, Inc. has maintained an accreditation to ISO/IEC 17025 in the field of calibration through the American Association for Laboratory Accreditation (A2LA) providing on-site services primarily within the industrial manufacturing marketplace. The mission of Controls Service, Inc. is clear: provide service that is undeniably “Second to None”. The phrase is more than just a slogan at Controls Service, Inc. It is their way of doing business and it can be seen in everything they do. That is why after more than 40 years in the field of calibration and process controls, Controls Service, Inc. remains at the forefront for quality of work and overall value. They pioneered service excellence and they remain the undisputed industry leader. Collectively representing well over a century of experience in the field of process controls, the Controls Service, Inc. staff is courteous, thorough, knowledgeable, timely and professional. They are experts at utilizing innovative resources and the latest technology to provide system oriented maintenance solutions tailored to the specific needs of their customers. From the aerospace heat treat facility to the automotive paint shop operation and everything in between, Controls Service, Inc. possesses the knowledge, ability, professionalism, and reliability to earn your trust. Allow them the opportunity to join your team. Controls Service, Inc. services most instrument manufacturers’ control units. Below is a brief list of many popular manufacturers we are capable of servicing and some of the systems we support. If you cannot find your instrument or manufacturer on our list, please do not hesitate to contact us. Most inquiries responded to in less than 24 hours. Allen Bradley, ABB, Ametek, Antunes, Ashcroft, Bacharach, Bailey, Barber Coleman, Chicago Safety, Chessell, Chino, Despatch, Dwyer, Eclipse, Enmet, Eurotherm, Fairchild, Fireye, Fisher, Fluke, Foxboro, General Electric, Hauck, Honeywell, Ircon, ITW/BGK, Kromschroder, Leeds & Northrup, Magnetrol, Marathon Monitors, Maxon, Mikron, Milltronics, MOCO, MSA, North American, Newport, Omega, Partlow, Protection Controls, Pyromation, Pyronics, Raytek, Red Lion, RKI, Rosemount, SSi, Taylor, United Electric, Vaisala, Watlow, Yokogawa, and many others! Air Supply Houses, Burner Management Systems, Combustible Gas Detection Systems, Conductivity, Extruders, Flame Safety Systems, Flow Measurement Systems, Forging Furnaces, Heat Treating Furnaces, Humidity Control and Monitoring Systems, Incinerators, IR (infrared) Systems, Lab Ovens, Level Control and Monitoring Systems, Paint Bake Ovens, Paint Spray Booths, pH Control and Monitoring Systems, Pressure Control Systems, Retorts, RTO’s, Rotary Kilns, Salt Baths, Temperature Control Systems, Tank Farms, Toxic and Combustible Gas Systems, Vacuum Furnaces, Waste Water Treatment Systems and many others! Controls Service, Inc. is the trusted source of process control maintenance, calibration, repair, and test services for many companies. From large corporations to small, family owned heat treat operations, Controls Service, Inc. provides the same level of commitment and dedication regardless the size of the project. Our reputation as the premier support service provider did not happen by accident. 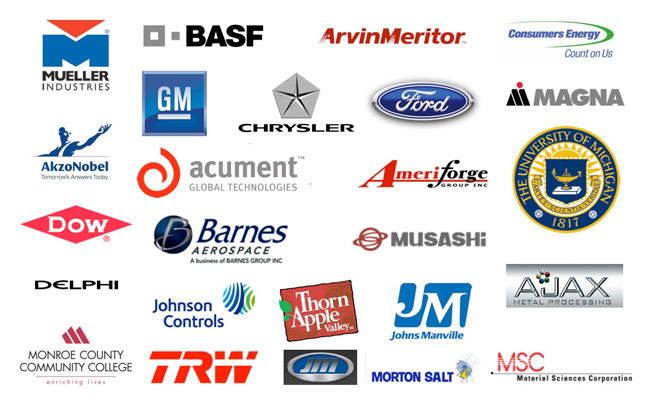 Here is a brief list of the many companies that we have helped along our 40-year history. Controls Service, Inc. has an extensive offering of services ranging from Calibration to Furnace Burner Adjustments. Below is a brief list of services offered. For a complete list, please visit the Services Tab. A large local inventory allows Controls Service, Inc. the ability to reduce the lead-time on most repairs or replacements. Controls Service, Inc. has an extensive inventory of thermocouples, controllers, and recorders as well as burner replacement parts and testing equipment. Below is a brief list of the products available. The list is not a complete representation of every product available. For a complete list, please visit Products page. Controls Service, Inc. was founded by Al Lefler in 1972 and functioned as the service arm for a major Systems Integrator. Shortly thereafter, Controls Service, Inc. set out on their own as a separate independent entity providing calibration and service support to the manufacturing marketplace. Al Lefler, the company founder, retired in 1992 and was succeeded by the current president and CEO, Darrell Rydzewski who has been with the company since 1984. Prior to his arrival at Controls Service, Inc., Darrell Rydzewski was employed with the Industrial Process Control Group of Honeywell since 1972. Darrell Rydzewski graduated from Lawrence Institute of Technology (now known as Lawrence Technological University) in 1977. Currently, Mr. Rydzewski, after 40 years in the business, still takes an active role in developing business relationships with customers.